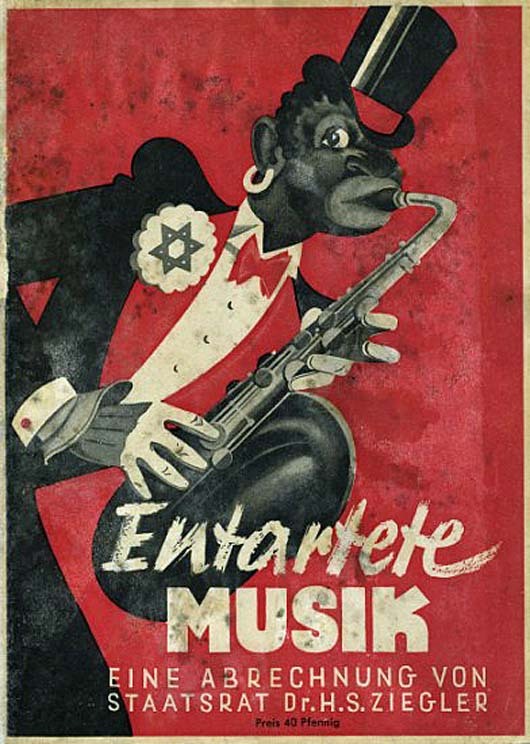 "Under the influence of the "Degenerate Art" exhibition (Entartete Kunst) in Munich, Dr. Hans Severus Ziegler organized an exhibition presenting the shallowness of black-Jewish music (mainly jazz, Jewish composers and modern avant-garde music), as compared with German music. For this exhibition, a real catalogue was not printed, only the booklet presented here, which includes the opening-speech by Ziegler (Goebbels also delivered a speech), quotations of Hitler's words, photographs, caricatures and paintings as they appeared in the exhibition. The impact of this exhibition was beyond expectations and it marked the climax of the dramatic change caused by the Nazis to the musical scene: Europe lost its composers, musicians, researchers and teachers who were persecuted and exiled using the excuse of scientific research; some of them were forced to cease composing and others were sent to concentration camps." Wikipedia essay on "Degenerate Art"